Details have been swirling the past few weeks involving the City of Houston's possible lease of space in the Exxon Tower at 800 Bell to house the city's deteriorating justice complex. It's been a topic on the minds of city leaders for years, and will be a decision that will shape the city's emergency departments for the next 20-50 years. City and political leaders, including Houston's police chief and presiding judge of municipal courts, have voiced their hesitation to the city's recently announced plan to house justice and emergency operations at 800 Bell. City leaders might like to see the justice complex rebuilt on its current site on Reisner and Lubbock streets, given its proximity to Downtown Houston, Harris County courts, and a concentration of transit options, including METRO's bus and rail lines. This City of Houston Public Safety Committee presentation provides a background of current conditions of the Reisner site. As reporter Mike Morris points out, the City of Houston is "soliciting information for the purpose of assisting the City’s consideration of ideas to provide public safety and courts facility improvements." You can find this request for information here. If you've got an idea for the justice complex, submit them by this Thursday, April 9, 2015! It's probably too late to start now, but I hope that additional proposals for the complex have been submitted. The proposal document also includes necessary specifications that must be considered in a proposal, including the location of the site being within, or within immediate proximity to downtown Houston, an inventory of approximately 5,000 parking spaces and be at least LEED Certified. In a city that is headed for budget troubles in the coming years, the city must look for creative ways to save money, or in rare cases, make some money. And, no, annexing more land will not be the long term solution to fill our funding. As the city looks to lessen the debt that will ultimately be incurred in the process of finding solutions for the aging justice complex, we must be open to any creative concepts. As part of a larger effort to decrease municipal spending, the city has already employed the One Houston campaign internally to save some cash. One Houston encourages "employees to adopt simple, cost-saving measures throughout their work life. As more employees make small changes to their work routines, the cumulative effect will have a major impact for the City." The city will essentially need to decide whether to build a new justice complex the traditional way, issuing bonds for the construction of a new justice complex, or enter into a Public-Private Partnership (P3) to either build the complex, or enter into a long term lease as a tenant in a nearby property. The City of Houston recently amended their guidelines for adopting a P3, and were presented a background of P3 options nearly a year ago, summarizing delivery options for the complex. These types of partnerships have been fairly rare in the United States, but have been used in many other countries. The state of California completed the construction of a courthouse in Long Beach, California in 2013, utilizing a P3. Unfortunately, with the budget problems facing the city, prime real estate, like that of the United States Post Office at 401 Franklin (which would make a great space for a justice complex) is far from reach. That land is currently for sale, but with real estate prices at record levels in Houston, there's little to no chance the city would be able to pursue that site. And, with a competing interest like the Texas Central Railroad, potentially offering high speed rail transit between Houston and Dallas, returning the Barbara Jordan Post Office at 401 Franklin to its original use as a train station, makes much more sense. If land acquisition will be an issue, the City of Houston might look to underutilized assets it already owns. For instance, the city owned parking lot tucked between I-45, Houston Avenue and Memorial Parkway, adjacent to the Fonde Recreation Center provides about 4 acres of land. The site is a walkable distance from the termination of METRO's soon-to-open Green and Purple lines, and downtown bus routes. The city should also not overlook using its current justice complex parking lot to build a portion of the justice complex. A temporary inconvenience in parking may well be worth the convenience of a centralized operation. A majority of the parking that is provided for City of Houston operations is on surface lots, which already fail do deliver the parking capacity needed. Parking garages will need to be built to accommodate the need for increased operations and public parking. It's time to intensify the use of the land for a justice complex. So, if the city cannot afford to purchase additional land necessary for a justice complex, and is having trouble figuring out where to even produce the money to enter into a long term lease as a tenant, what is a city to do? In 2012 when Florida Atlantic University was searching for a corporate sponsor for their then-new football stadium, private, for-profit prison operator GEO Group donated $6 million for naming rights. As one to never to overlook a pun, I must include that the newly built football stadium earned the name "Owlcatraz" after the GEO Group's donation. After weeks of pressure from students and the surrounding community, GEO Group withdrew their deal. The situation even made it to the Colbert Report. Now, no one will want to associate themselves with a jail, much like everyone learned in the GEO Group sponsorship at Florida Atlantic, so there has to be a higher level of branding at play here. What's something more appealing? Justice. Everyone wants justice, or to be accountable for providing justice, even though there will inevitably be varying opinions on what may be just. So, why not have your company sponsor the building and operation of a justice center? Companies spend billions of dollars on advertising each year for collegiate sports stadiums, many which only fill up a few times a year, if they're lucky. Granted, television and media outlets provide an enhanced viewership for sponsors, reaching millions of viewers, so there is increased exposure for the sponsors of larger schools, and sponsors wouldn't be squabbling to have their name put on the sides of buildings if it wasn't profitable. It works. But why overlook alternative sources of sponsorship and advertising? I have gotten only one ticket in my life, and it was within the last year, as I did not have my license plate affixed to the most forward point on my vehicle. I made a quick fix and had the ticket waived before a judge the next day. Upon my visit, I learned just how many people visit the municipal courts. There are an average of about 3,000 hearings/cases per day just for the Reisner location. Over the course of the year, that's a sizable population of about a million people involved in some sort of cases, not including anyone else that is accompanying those visiting the courts. But think about the sponsorship opportunities that would lie ahead. Sponsors could be found for all aspects of a judicial center! A paper company could sponsor the dockets and tickets that are produced and provided. Their logo could be at the bottom or back of each, just like coupons are printed on the backside of grocery store receipts. Electronics companies could sponsor the televisions and electronics used in legal proceedings. (This hour of court reporting is brought to you by __________!) 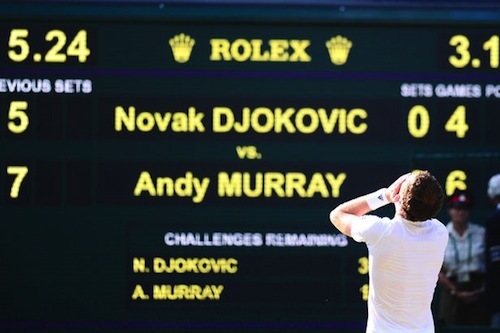 People spend a great deal of time waiting for court proceedings, so why not have someone sponsor the clocks, much like Rolex does for the match length at Wimbledon? Given that court can be one of the most uncomfortable places to visit, I wonder if Houston-based Conn's or Mattress Firm would sponsor a comfort station. Or, could you imagine our police, fire and emergency medical service people's uniforms looking like a NASCAR driver's fire suit, or our fire hydrants and fire trucks being sponsored by Aquafina or Dasani? These outlandish suggestions would just help defer operational costs or make the courtroom experience a bit more palatable, but what about a larger sponsor for the entire complex? "The Academy Sports and Outdoors Justice Complex: Helping Houston Exercise Justice." "United Airlines; Injustice Doesn't Fly With Us." "Exxon/Shell/Halliburton/BP/KinderMorgan/anyotheroilcompany; Fueling Justice in Houston." Some believe that there is a great deal of untapped potential in municipal marketing. Rahm Emanuel took some flack in Chicago in 2011 when the City of Chicago sold advertising space on Chicago River bridges to Bank of America. It should be noted that the goal of this type of advertising, and any other municipal sponsorship, would be to continue to develop partnerships, not just simply selling space for signage. We can also look to Chicago for the example of sponsorship in Millennium Park. As noted in the previously mentioned article from "The Week", NamePlace, a start up based in California, aims to match government and non-profits to those donors seeking to sponsor something. NamePlace helps create "a global marketplace designed to showcase sponsorships and naming rights, especially on the “long-tail.” The result: a new way for advertisers to engage with communities on a neighborhood level." There's a great deal of detail surrounding this topic that I am sure I may not have the full comprehension of, and welcome any clarification. And, of course, these suggestions for Houston's justice complex are made in fun, but at the same time, bring to mind the entertaining and creative maneuvering that will probably have to take place in government in order to be able to continue to provide residents with the resources and justice that they deserve and demand. If political leaders continue to promise that they will not raise taxes, where will the money come from? The cost of doing nothing in a case like this may be greater than losing the short-term political clout that comes from raising taxes, or the creative sponsorship of our city's services.